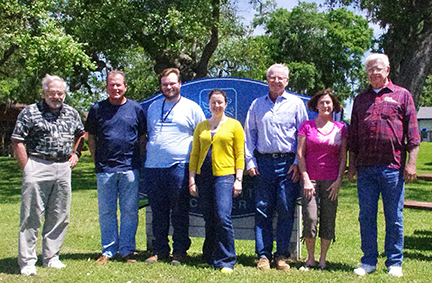 Attending the training session was, left, Jim Hillis, Tim Logan, Will Merrell, H-GAC Texas Stream Team Coordinator, Aubin Phillips Pickens, H-GAC Senior Environmental Planner, Ken Wright, Ana Pogue and Valroy Maudlin. Will Merrell carries items needed to collect a water sample from the river with Valroy Maudlin and Aubin Phillips Pickens. a three phase training program using test kits that measure physical and chemical parameters of the water of the San Bernard. Volunteers are asked to monitor their site on the river monthly at the same time of day each month, for a two year commitment. 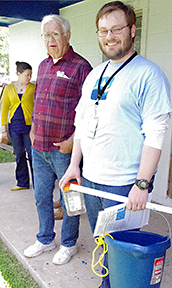 They submit their completed information to the H-GAC Texas Stream Team Coordinator. The data is forwarded and analyzed to create quality assured scientific reports. Read Valroy’s monthly reports. 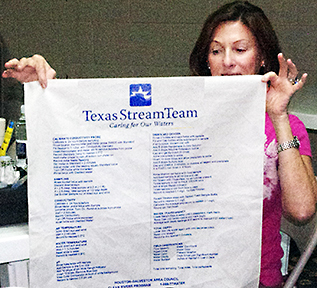 Established in 1991 as Texas Watch, Texas Stream Team is administered through a cooperative partnership between Texas State University, the Texas Commission on Environmental Quality (TCEQ) and the U.S. Environmental Protection Agency (EPA).